Q: The Mombasa-Nairobi railway constructed by the Chinese company was officially launched yesterday. State Councilor Wang Yong attended the ceremony as the special envoy of President Xi Jinping. The Kenyan side is full of praise for the railway. What is your comment on that? A: On May 31, State Councilor Wang Yong attended the launching ceremony as the special envoy of President Xi Jinping and conveyed warm congratulations on behalf of President Xi Jinping. A passionate speech was given by Kenyan President Kenyatta at the ceremony who thanked President Xi Jinping, the Chinese government and people for the important contribution to Kenya's development. We can feel the joy and excitement of the Kenyan people tens of thousands of miles away at the ceremony. The Mombasa-Nairobi railway is an important early fruit of the Belt and Road Initiative and the ten major cooperation plans of the FOCAC Johannesburg Summit. It is the landmark project of building three networks and promoting industrialization in Africa and enhancing industrial capacity cooperation between China and Africa. It is the largest infrastructure project since the independence of Kenya and the flagship project of Vision 2030, making up an important part of the railway network in East Africa. The main artery of communication in East Africa, which showcases China-Kenya friendship and mutually beneficial cooperation, is of great and far-reaching significance to the economic and social development of Kenya and other countries in the region, interconnectivity in East Africa, industrialization in Africa, and the promotion of Belt and Road in the hinderland of Africa. With the commitment of leaders of China and Kenya and joint efforts by builders of the two countries, the completion of the railway demonstrates the China speed, China quality, China contribution and China spirit, translating the principle of sincerity, practical results, affinity and good faith, as well as the value of justice, friendship and shared interests into concrete actions. The railway was completed in two and a half years, taking half as long as expected but meeting all the quality requirements. The railway will make it more convenient for people to travel between Mombasa and Nairobi, shorten the time of freight transportation from over 10 hours to around 4 hours and cut the cost by 10-40%. The construction of the railway will help increase Kenya's GDP by 1.5%. Having created 46,000 local jobs and engaged over 300 local companies in subcontract, the railway also drives local industrial development. Paying great attention to technology transfer and mentoring, the Chinese company will help Kenya establish a railway engineering academy. They have also fully funded 100 Kenyan students' study in China and offered 44,000 training opportunities for Kenyan employees. Sticking to the guiding principle of environmental protection, the Chinese company did their utmost to prevent the ecological environment along the railway from being damaged and effectively protect the vegetation and wildlife. Along the railway there are 14 passages for large animals, 79 bridges and over 100 culverts where wild animals can pass easily, even giraffes do not have to bow their heads. Following the principle of intensive growth, the Chinese side will work with the Kenyan side to build industrial parks along the railway, create a new pattern of cooperation via the building of the Mombasa-Nairobi railway, Mombasa port and Mombasa special economic zone, set a new example for China-Africa industrial complementarity and industrial capacity cooperation, transform and upgrade China-Africa cooperation to make it more excellent and efficient, and deliver more benefits to Chinese and African people. Q: It is reported that US President Trump will make public his decision on the Paris Agreement on June 2 Beijing time. There are reports saying that he will announce the withdrawal of the US. How does China view this? It is also said that China and the EU will issue a joint statement tomorrow in support of the Paris Agreement. Can you confirm that? A: Climate change is a challenge for the whole world and no country can stand aloof. The Paris Agreement is a hard-won result which represents the broadest consensus of the international community and sets the target for the global campaign against climate change. The general trend of green, low-carbon and sustainable development advocated by the Paris Agreement coincides with China's policy of promoting ecological advancement. However the other countries may change, China will continue to pursue innovative, coordinated, green, open and shared development, bear in mind its domestic requirements for sustainable growth, step up concrete efforts to deal with climate change and faithfully implement the Paris Agreement. China will stay committed to upholding and promoting the global governance on climate change, and take an active part in the multilateral process on climate change. We will work with all relevant parties to safeguard the outcomes of the Paris Agreement, press ahead with the negotiation and implementation of the enforcement rules, and promote green, low-carbon and sustainable growth of the world. China is willing to strengthen effective communication and practical cooperation with the EU in climate change to safeguard and advance the process of multilateral governance on climate change. Q: According to some foreign media, the Mombasa-Nairobi railway is a costly project mainly funded by Chinese loans which Kenya may not be able to repay. What is China's comment on that? Is China worried that the Kenyan side cannot pay back the loans on time? A: As the Chinese saying goes, wealth will come when roads are built. Backward infrastructure, lack of fund and talent shortage are three obstacles obstructing Africa's realization of sustainable growth. He who helps Africa overcome the obstacles is Africa's true friend and reliable development partner. What we have learnt from the past decades of development is that railways should go hand in hand with industrial parks and special economic zones so that infrastructure development and industrial development can reinforce each other. The Mombasa-Nairobi railway built with Chinese financing is an example of China's concept of intensive growth and China's high sense of responsibility. The construction company and the financial institution of China made construction and financing plans based on scientific appraisal of the feasibility of the project, taking into consideration the development level and bearing capacity of Kenya, so as to ensure that the railway will create economic and social benefits and prevent Kenya from any new debt risks and financial burden. China and Kenya have come to an agreement on the overall plan for the future development of the Mombasa-Nairobi railway. The two sides will step up the construction of industrial parks along the railway and create a growth pattern with the Mombasa-Nairobi railway, Mombasa port and Mombasa special economic zone developing side by side. In that case, the construction of railway will stimulate industrial and economic growth, and vice versa, which will ensure the sustainable development of the Mombasa-Nairobi railway, Kenya and China-Kenya cooperation, and make local-oriented projects the driver of industrialization in Africa, delivering benefits to people of China and Africa. Q: Republican US Senator John McCain said on May 30 in Sydney that China is behaving like a "bully" with its militarization of islands in the South China Sea, adding that filling in these islands and militarizing them are in violation of international law. What is China's comment on that? A: I have seen the report and the Global Times' editorial which struck home. Some people in the US always talk about international law, but in most cases, either know nothing about the law or deliberately misrepresent the law, just like what Mr. McCain did-misleading the public-and we are firmly opposed to that. China's position on the South China Sea issue is consistent and clear. China has indisputable sovereignty over the Nansha Islands and their adjacent waters. It is lawful, legitimate and reasonable for China to conduct peaceful construction and deploy necessary defence facilities on its own territory, which is to exercise the right of self-preservation and self-defence under international law, and has nothing to do with militarization. Facts have told us who is the one that keeps challenging other countries' sovereignty and security by sending vessels and aircraft for close-up reconnaissance in the South China Sea. 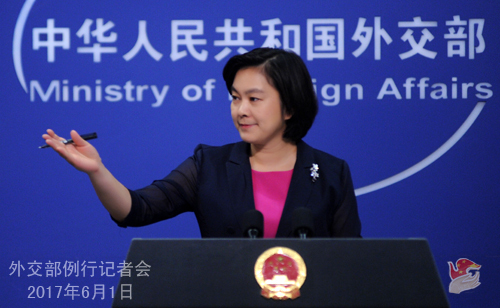 Under the concerted efforts of China and ASEAN countries, the situation in the South China Sra has turned positive. We call on relevant people from the US to set aside prejudice, do away with the cold war mentality, and do more for regional peace and stability, rather than the opposite. Q: The Japanese Prime Minister proposes to revise the Pacifist Constitution, particularly Article 9 of the constitution, which would legitimize the military. He may put this to a referendum about next year. How concerned is China about this proposal? Does the Chinese government believe that the revision to the constitution could lead to the Japanese military expansion? Should the region be concerned about this? A: Due to historical reasons, the international community, and Japan's Asian neighbors in particular, always keep a watchful eye on Japan's move in the military security field. It is hoped that the Japanese side will uphold the Pacifist Constitution and stick to the path of peaceful development. Q: The Shangri-La Dialogue will be held in Singapore tomorrow. The Defence Ministry said last week that China will send an official from the PLA Academy on Military Science to the dialogue, while in the past years, there was always a delegation led by the deputy chief of general staff. That reminds me of the Belt and Road Forum for International Cooperation held in May, as Singapore was one of the few ASEAN countries that did not send leaders to the forum. Are we feeling a chill in the relationship between China and Singapore? 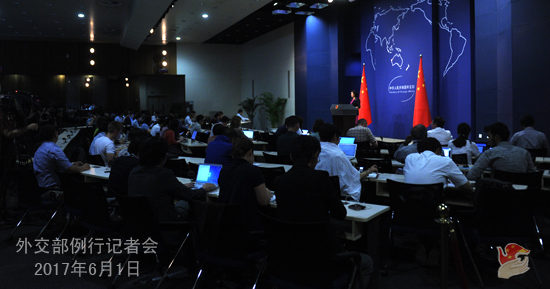 A: China attaches importance to international and regional multilateral security dialogues. This year, an official from the PLA Academy on Military Science will lead the delegation to the dialogue. That is a decision made by China in accordance with work requirements. It has nothing to do with China-Singapore relations. It is far-fetched and pointless to link that with the bilateral relationship and the Belt and Road. Lawrence Wong, Singapore's Minister for National Development and Second Minister for Finance, attended the Belt and Road Forum for International Cooperation upon invitation as the representative of Singapore. The two sides signed an MoU on intergovernmental cooperation on the Belt and Road. Singapore is an important member state of ASEAN and has established with China the all-round cooperative partnership progressing with the times. The two sides conduct mutually beneficial cooperation in a wide range of areas. The Chinese side values its relations with Singapore and would like to enhance bilateral cooperation under the framework of the Belt and Road, increase political mutual trust, strengthen exchanges and cooperation across the board and maintain the sound and steady growth of the bilateral relations. Q: It is reported that four more launchers for the THAAD system deployed by the US in the ROK have been secretly delivered to the ROK. Has the Chinese side lodged representations with the ROK side? 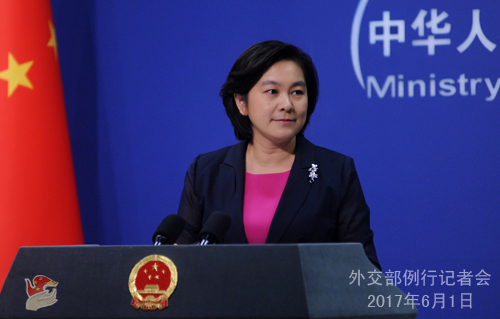 A: I made China's position clear at yesterday's press conference. The deployment of THAAD by the US in the ROK jeopardizes China's strategic security interests, disrupts regional strategic balance and does no good to denuclearizing the Korean Peninsula and maintaining regional peace and stability. It runs counter to the efforts of resolving the issue through dialogue and consultation. The Chinese side is firmly opposed to that. We have lodged representations with the ROK and expressed our strong concern and solemn position. We strongly urge the US and the ROK to immediately stop and call off their deployment of the THAAD system. Q: India and Pakistan will complete the process of becoming members of the Shanghai Cooperation Organization (SCO) during the upcoming summit in Astana, making the SCO world's largest regional cooperation organization. Do you see any positive impact of this membership on the bilateral relations between India and Pakistan? A: I see the journalist from Pakistan sit right here, while journalists from India sit over there. Maybe someday you can sit closer to each other. It is the consensus of SCO members that the organization admits new members in an orderly manner. At the SCO Ufa Summit in 2015, member states inaugurated the procedure of India and Pakistan joining the SCO. A memorandum of obligation to join the SCO was signed by India and Pakistan at the Tashkent Summit in 2016. SCO members as well as India and Pakistan are going through the legal procedure, including fulfilling obligations stated in the memorandum, and are making smooth progress. The procedure for the admission of India and Pakistan will be completed at the upcoming Astana Summit. That will be the first time for the SCO to admit new members since establishment, making the SCO the most populous regional cooperation organization boasting world's largest area. The SCO will embrace unprecedented space for development and potential for cooperation. We sincerely hope that after their admission, India and Pakistan will act in strict accordance with the SCO Charter and the Treaty on Long-term Good-neighborliness, Friendship and Cooperation, work for the shared goal, conduct friendly cooperation, uphold the Shanghai spirit, improve their relations and add fresh impetus to the development of the SCO. Q: The ROK Unification Ministry reportedly approved a civic group's request to contact its counterparts in the DPRK for commemoration of the June 15 Joint Declaration, saying that the ROK government will be flexible about civil exchanges between the ROK and the DPRK as long as they do not violate international sanctions on the DPRK. What is China's comment on that? A: We have noted the report and believe that it is a positive signal from the new ROK government on its DPRK policy. We welcome that. The Chinese side encourages and supports the DPRK and the ROK in conducting active and constructive dialogue and contact to increase mutual trust. Steps taken by the two sides for communication is of positive significance, especially under the current circumstances, to easing the tension, promoting reconciliation and cooperation and resolving the Korean Peninsula issue through dialogue and consultation. Q: What kind of communication has China been having with President Trump over his decision on whether to pull out of the Paris Agreement? A: China and the US maintain close communication at all levels on a variety of topics. Q: Further to what you said about Indian's and Pakistan's admission to the SCO, has the process of admission been completed? So they will be declared as full members in the next summit? A: As I just said, SCO members as well as India and Pakistan are going through the legal procedure, including fulfilling obligations stated in the memorandum, and are making smooth progress. The Chinese side welcomes and supports the joining of India and Pakistan in the SCO at this year's Astana Summit. It is foreseeable that the upcoming summit will complete the admission procedure of India and Pakistan. Q: You mentioned that China is in close communication with the US government on a variety of topics and stated China's support for the Paris Agreement. At Davos, President Xi Jinping urged countries to stick with the agreement. Can you confirm that it is still China's policy and comment on whether China has urged the US to stick with the agreement? A: I have stated China's position. To satisfy China's domestic needs for ecological advancement and deal with climate change through international cooperation, China supports all parties' implementation of the Paris Agreement, and stands ready to work with the international community to carry forward the outcomes of the agreement so as to realize green, low-carbon and sustainable growth around the world. China's position is clearly known to all. Q: With US aircraft carrier battle group moving to the region due to the DPRK's missile launches, the world looks to China for a bit of leadership. Has China been in contact with the DPRK leader on a daily or weekly basis to turn down the tensions? A: The Chinese side is in close communication with all the other parties of the Six-Party Talks on the situation of the Korean Peninsula. It is true that there are some positive elements in the developments of the situation. For example, the US expressed its readiness to solve problems through dialogue, and the ROK new government signaled that they are open to contact with the DPRK. But there are also some negative elements, like joint drills of aircraft carriers. The current situation on the Peninsula is highly complex and sensitive. We hope that there will be more positive elements and less negative ones, and that all parties will make concrete efforts to lower the tension and increase mutual trust, and create conditions for the return of the Korean nuclear issue to the right track of dialogue and consultation.